The report consists of thirty-three thematic sections, prepared by representatives of various human rights organizations, government agencies and higher educational institutions, including UHHRU, KHRPG, NGO “Institute for Religious Freedom”, NGO “Institute of Legal Research and Strategies”, the Coalition “Rights of the Child in Ukraine”, the Civil Network “OPORA”, the Constitutional Court of Ukraine, Yaroslav Mudryi National Law University and others. The report of human rights organizations “Human Rights – 2016” is available at the UHHRU web page. According to Yevhen Zakharov, Director of KHRPG, the state of human rights had significantly deteriorated over the past year. He made this conclusion, because of the following main trends: escalation of violence and hatred, significant narrowing of the freedom of expression, as well as significant increase of poverty and social inequality. In particular, he stressed the strengthening of human rights violations by the Security Service of Ukraine and highlighted that there are gross violations of the right to asylum. ‘Most complaints are complaints of torture by law enforcement, namely the Security Service of Ukraine. The Commissioner for Human Rights has about half human of such complaints,’ said Yevhen Zakharov. 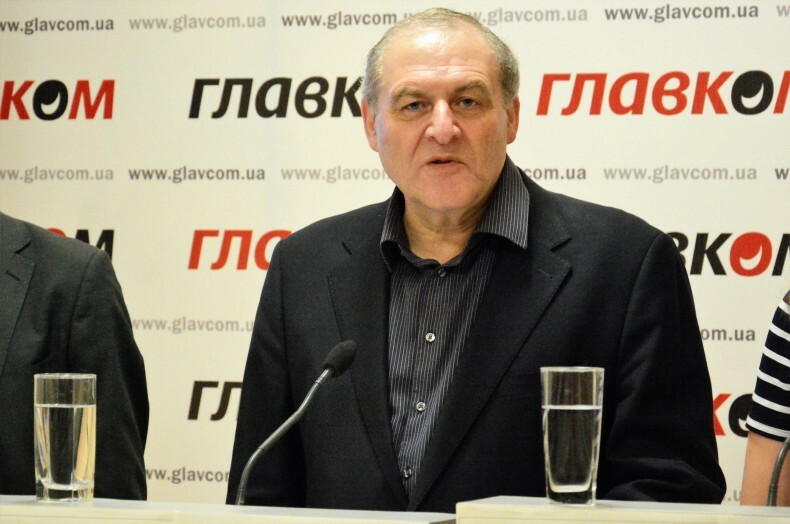 The Director of KHRPG described the extremely difficult human rights situation on the occupied territories, in the “grey” zone and the problems with the exchange of captives. Talking about the reform of the Ministry of the Interior, Yevhen Zakharov said that currently the reform is more difficult to carry out than two or three years ago, because “the system has recovered.” He also said about layoffs from the National Police because of low wages during the reform, which resulted in a lack of human resources in autumn 2016, and, in turn, this contributed to the growth of crime. Lawyer of the Ukrainian Helsinki Human Rights Union Daria Svyrydova, talking about the human rights situation in Crimea, said that the main violators of human rights in the occupied peninsula are both the Russian Federation, state-invader, and Ukraine. As for the actions of the occupation regime, first of all, we are talking about the forced resettlement of inhabitants from the peninsula to the other regions of Russia, which is a war crime. This is especially true for people, who are in prison. 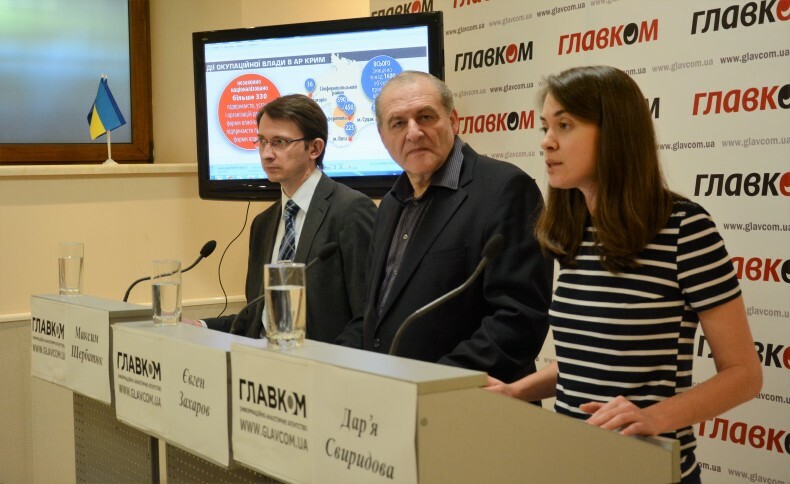 According to Daria Svyrydova, the freedom of speech in Crimea is almost destroyed. This is indicated by profile cases against journalists, as the case of RL journalist Mykola Semena, who is judged because of his views in his professional activities. The human rights defender said that nowadays not only the opposition media or activists are persecuted but also those loyal to the occupation regime journalists who attempted to conduct investigations related to corruption. The ban of the Mejlis also leads to constant persecution of the Crimean Tatars by the occupying authorities. Also in 2016, there was a tendency to arrest so-called “saboteurs” and “spies” among the population of the peninsula, and among Ukrainian citizens, who came to Crimea. Daria Svyrydova stressed the violations of religious freedom. Primarily regarding Muslims from the Tatar community, as well as parishioners of the Ukrainian Orthodox Church (Kyiv Patriarchate), most religious buildings which are now transferred to the property of the Russian Orthodox Church. Today the UOC (KP) owns only one temple in Simferopol. Regarding violations done by the Ukrainian side, Daria Svyrydova drew attention to the recognition of documents in Ukraine, issued to Ukrainian citizens in occupied Crimea. Under international humanitarian law, Ukraine can recognize the information specified in those documents, namely the acts of birth and death registration, because Russia is recognized as the invader state, and it has the duty to issue documents to citizens on the territory de facto controlled by it. According to the human rights defender, specific problems of Crimean IDPs are particular unregulated commitments, when registering retirement benefit, to prove that they do not receive it from the Russian Federation. Daria Svyrydova also drew attention to the discriminative statement by the President on obtaining biometric passports to citizens living on the occupied territories. 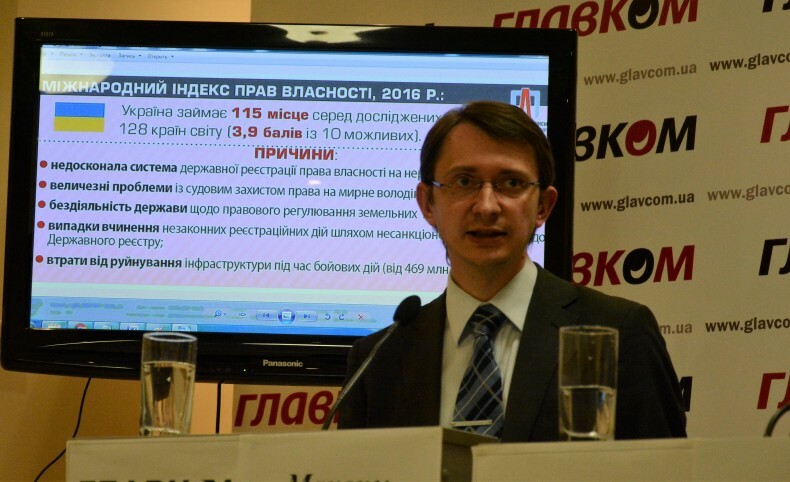 Maksym Shcherbatiuk, UHHRU Program Director, described the main trends of the property rights and socio-economic rights last year. He noted that the situation with property rights had deteriorated in 2016. According to Mr. Shcherbatiuk, it was also said by international organizations, including Property Rights Alliance, which ranked Ukraine among the last. One of the key issues is a terrible state of implementation of court decisions for the property protection. Now we can talk about tens of billions of hryvnia debt in this respect. He also noted the passiveness of the state to unlock the moratorium on land transfer. Maksym Shcherbatiuk also noted that in his view, the situation in the field of socio-economic rights is close to catastrophic. He mentioned the high level of poverty and huge increasing gap between the income levels. ‘Before we did not talk about public authorities, but now we talk about government agencies as well. This is a huge gap’ said the UHHRU program director.